Adjust Brightness & Color PIR Motion Sensor, Ultrasensitive Detection, Start Your Intelligent Life! Brightness Adjustable, Say bye-bye to Bumping into Obstacles in The Dark! Freely Switch Between Warm and Cool White, Change Color Follow Your Mind! Easy Charge & Install Low Power Consumption Fully Charged for 3 Months! USB Rechargeable, No More Waste of Batteries! Stick-on Anywhere You Want, No hassle on Installation! Decoration & Gift Polished ABS Shell, Built-in Magnet, Top Quality! Elegant Decoration for Hallway, Bathroom, Kitchen, Closet! Exquisite Special Gift for Anniversary, Festival, Birthday! Read more ”M” Button Guide: Single Press: Warm/Cool White Switch Double Press: Brightness Adjust Long Press: Long Bright Model Specifications: 1. Sensor Distance: 4 m 2. Sensor Angle:110° 3. Lighting Color: White & Yellow 4. LED QTY: 10pcs 5. Life Span: 500,000 Hours 6. Material: Aluminum + ABS 7. Size: 3.2 x 3.2 in (L x W) Features: 【Unique Lemon Design】: Cute and special! 【Ultrasensitive Detection】: PIR Activated automatically! 【1 Lamp, 2 Lighting Colors】: Freely switch between Warm Yellow and Cool White! 【Adjustable Brightness】: Wide range levels of illumination! 【Energy Efficiency】: USB Powered, rechargeable! 【Built-in Magnet】: Stick-on anywhere, No hassle on installation! 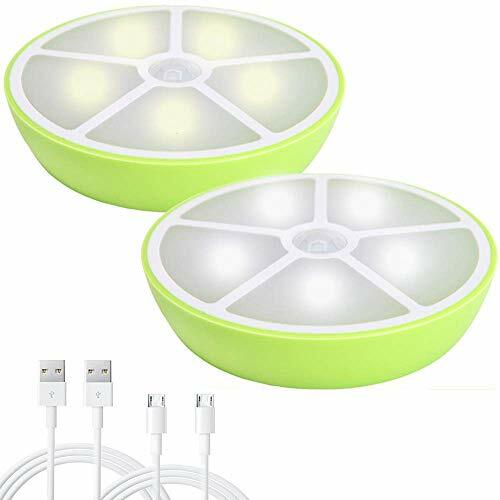 Package Contents: 2 x PIR Motion Sensor Light 2 x USB Cord 2 x 3M Double-sided Adhesive Pads 2 x User Manual Warm prompt: 1. The light won't turn on if the light sensor has been detected by the enough light. 2. Never install the light near the place where is damp or with high temperature to ensure the sticky tape work well.